Pasteles are a beloved traditional dish from Puerto Rico that just happen to be naturally paleo. My mother-in-law is from Puerto Rico, and she taught me the recipe that has been passed down in her family for generations. Pasteles can be quite intimidating and difficult to make if you try to work from a cookbook. That's why I have included videos so that you can see exactly how to assemble and wrap them. Different families have different traditions for their pasteles -- I am sharing one version, but if you ask 10 different Puerto Ricans how to make them, you will get 10 different recipes. The masa (dough) can be made with varying amounts of the ingredients I use here (green bananas, calabaza -- a tropical squash -- and yautia/malanga) or with different ingredients like potatoes, taro, or yuca (aka cassava, manioc). The filling is most traditionally made of pork, but chicken also works very well. You can use shredded leftovers from a roast or you can cook meat especially for pasteles. I often have extra shredded chicken in my freezer from some recipe or another (or as a bone broth by-product). That's perfect for this recipe! For authentic traditional pasteles, you will need two Puerto Rican kitchen cooking staples. One is aciete de achiote, or, oil infused with annatto; the other is sofrito, a fresh seasoning mix made of vegetables and herbs that goes well with just about anything. It's like their version of the French mirepoix (a diced mixture of two parts onion to one part celery and one part carrot). I recommend making abig batch of sofrito and freezing in portions to use later. Sofrito + fat of choice + any meat + hot skillet = easy, flavorful meal in a jiffy. To make AIP pasteles, omit the annatto and just use plain olive oil or lard. Honestly, I usually omit the annatto step anyway because it's just one more bit of extra work in an already long process! I'll teach you how to do it if you really want, but it's really just for the aesthetic purpose of dying the pasteles; it doesn't do much flavor-wise. And, like with pasteles, if you ask 10 Puerto Ricans what they put in their sofrito, you will get 10 different answers. This is my husband's family recipe. 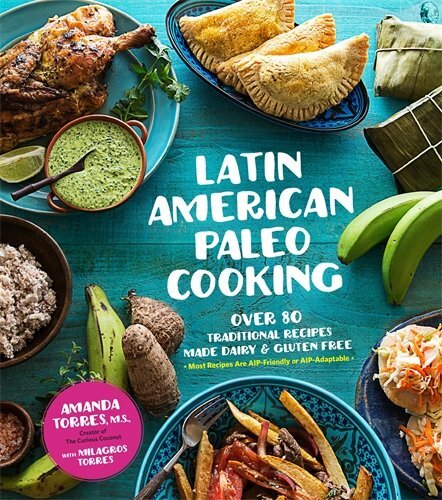 My mother-in-law contributed many family recipes to Latin American Paleo Cooking, and I also covered many other countries, including Cuba, Dominican Replublic, El Salvador, Venezeula, Colombia, Argentina, and Brazil. Buy it on Amazon or wherever books are sold. 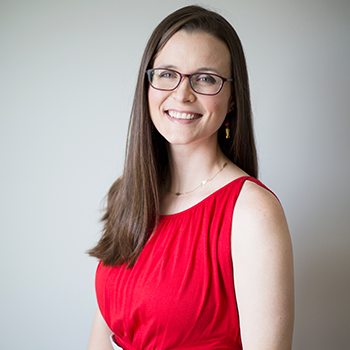 Learn more about the book in this blog post. Over 90% of recipes are AIP or easily adaptable. Pasteles can be made any time of the year, but it is a tradition in many Puerto Rican families to make a huge batch of them when all the family is together during the holidays. Everyone can pitch in to help the process go faster, because it is a lot of work to make them. I do it a few times a year by myself and make a very large batch that I freeze and eat from over several months. Many families will make them at Thanksgiving so that they have them available to eat all December long. They are a traditional New Year's food, too. 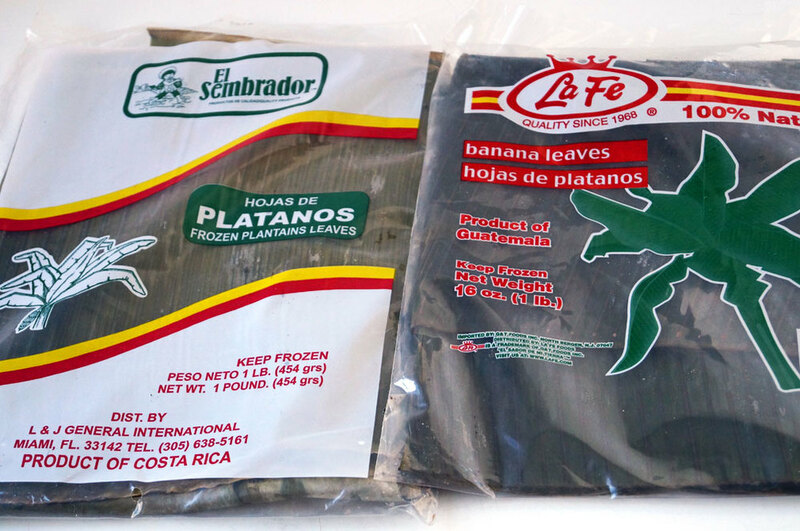 Check your local Hispanic market's freezer section to find steamed whole banana leaves. Or, apparently, you can buy them on Amazon now! Interesting. Anyway, to prepare them for wrapping your pasteles, spread them out on a table or large counter and cut into approximately equal-sized (doesn't have to be exact) squares about 12"-16" square with kitchen shears. Discard any areas that are torn or excessively full of holes so your masa doesn't leak out. The second best option is to look for "pastele paper" at your Latin market, usually sold in the produce section by all the tropical root veggies. It is a type of parchment paper pre-cut to about 12" by 18" for making pasteles. It is also a bit thicker than normal parchment paper that I've seen. If you can't find banana leaves or pastele paper, you can use regular parchment paper. Just cut it into equal-sized squares. This looks like the right kind of stuff, and is already pre-cut into a good size. Calabaza - This is a type of tropical squash that you will usually find cut into chunks in the refrigerated section of your local Latin grocery store, or, if you live in certain parts of the country, regular grocery stores. If you can't find it, don't worry, substitute any other orange-fleshed squash like butternut or acorn. Green Bananas - I'm not talking about the kinda sorta green bananas that you find in the regular banana section at the grocery store -- I'm talking about totally, 100% green bananas that haven't been treated with ethylene gas to force the ripening process to start. Again, hit up the Latin, Asian, or African market for them. If you're lucky, you may find green banana masa in the freezer section of one of those markets. That will save you a lot of time! Substitute the greenest bananas you can find at your supermarket if you have to. You may have to plan ahead and speak to the produce manager at your store and tell them you want to buy the greenest bananas possible as soon as they arrive at the store. Malanga/yautia - Again, hit up your Latin, Asian, or African market to find these funny brown roots. These are long with a dark brown hairy skin. They come in a variety of colors: white, yellow, and lilac. You can substitute taro root, if you can find it. If not, I would suggest using white potatoes. Break it up into 2 days. Make the masa 1 day in advance and refrigerate it. The dough is much easier to work with cold. Also, my mother-in-law says that it prevents the dough from tasting bitter. Skip the process of infusing the oil with annatto to save time. Make a big batch of sofrito the first day, and after assembling the pasteles on day 2, freeze the leftovers in portions (an ice cube tray works well for this) to use later. Use it to season any meat or even rice, if you include it in your diet. Make room in your kitchen. You will need a large work surface to prepare the banana leaves and for the assembly station. You will need a very large bowl to hold all of the dough. Recruit help! It is a fun process that is so much easier if you have some extra help. This recipe makes a lot of pasteles so you'll be glad to share some with your helpers. WATCH THE VIDEOS! It's hard to explain in words the process of assembling, wrapping, and tying the pasteles. Watch and re-watch the video until you get a hang of it. I learned by watching my mother-in-law. I would have never been successful if I had worked straight from a cookbook! Read the complete instructions before starting anything. Find the videos at the end just before the recipe. Arrange the workstation with banana leaves (or parchment paper), oil, masa, filling, and olives. Have string cut to tie them up after wrapping. Layer all the good stuff in, wrap up, and either boil now or freeze for later! After cooking, carefully cut the string and unwrap. Take care not to burn your fingers! Please watch the video to see how it is done. 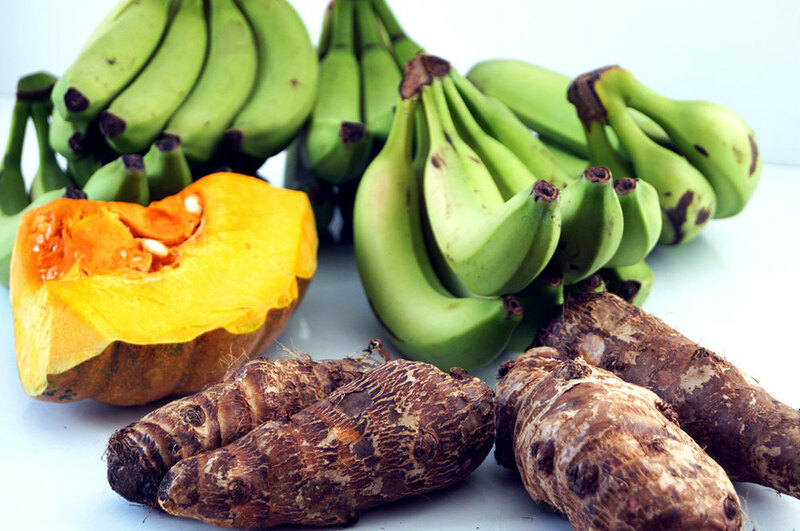 It is very similar to peeling a green plantain, but can be a bit trickier. The secret is the way you use your thumb. Oh, and please don't try this if you have a manicure. You'll ruin your nails! And please note that your fingers will turn a little black from the peeling process. Don't worry - it washes off easily with hot soapy water. Here's the video to show you how to assemble, wrap, and tie your pasteles! Pay attention to the tying part -- I have no idea how to describe that in words so you have to watch the video to see how it is done! Puerto Rican pasteles are a traditional holiday dish, made of paleo-friendly starchy tropical fruits, vegetables, and roots. Minor modifications make this autoimmune paleo, and regardless of dietary preference, unrwapping these delicious treats is like opening Christmas presents! 5 packs banana leaves, rinsed and cut into roughly 12"-16" squares; alternatives: "pasteles paper" from a Latin market, or plain parchment paper, cut into sheets about 12" by 16-18"
The day before you want to make the pasteles, there are several things you can do to prep. The first is to make the masa (dough). To prepare the green bananas (WATCH THE VIDEO! ): use a knife to cut the tips off both ends. Cut a slit running the length of each banana into the peel (not the fruit) with the knife, then peel away the outer skin by working your thumbs into the slit. Use the knife to shave away any fragments of peel left on the banana. Cut or break into about 4 pieces. To prepare the malanga/yautia: use a sharp vegetable peeler to peel the skins off. Cut into coarse chunks. To prepare the squash: if using calabaza, it was likely already cut into a portion at the grocery store. Remove seeds and cut away outer skin. If using an alternative squash like butternut, cut in half, scoop out seeds, and peel away outer skin. Cut into chunks. Traditional method for making the dough: use a box grater to grate all of the vegetables. 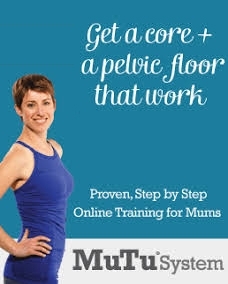 I do not recommend this method as it is so time consuming! But, if you have a large group of people and several graters, go for it! Shortcut Method: use your high-speed blender (like Ninja, Vitamix, or Blendtec) to puree all of the starches. Work in batches and add chicken broth a few tablespoons at a time as needed to get even blending. Add each batch of pureed veggies to a very large bowl. Add the 2 Tbsp salt. Use your hands to really dig in and evenly combine everything into a uniform, evenly mixed dough. Place masa in the fridge in a covered bowl overnight. This prevents the dough from tasting bitter and also makes it easier to work with. Still the day before: make sofrito/AIP alternative: Combine onion, cilantro, peeled garlic, peppers (or celery and carrots), and oregano in a blender or food processor and blend until it makes a paste. After you make the pasteles, don't forget to freeze the leftovers (use an ice cube tray to freeze in portions). If you want to dye your fat with annatto Add lard or olive oil to a small saucepan and heat over medium for several minutes, until you see the first tiny bubble form, then turn off the heat, add seeds, and stir often. Continue stirring for several minutes until you have a deep orange/red oil. BE CAREFUL not to heat the oil too hot; this will cause the seeds to turn black and the oil to turn green and you will have to throw everything away and start over. I also recommend cooking the meat the day before and chilling it in the fridge overnight. In a large skillet, heat the 6 Tbsp oil (dyed or not) over medium heat with the 6 Tbsp of sofrito for about 1-2 minutes, until nice and fragrant. Add pork or chicken chunks, culantro leaves, oregano, salt, and drained capers and saute until meat is cooked through. One last task for the day before: remove banana leaves from freezer and place in the fridge to allow them to thaw. The Big Day: Begin by preparing the banana leaves. You will need a lot of counter space or a table to work on. Spread the leaves out and cut out the central stalk and discard. Cut leaves into equal-sized squares, about 12"-16" inches square. Discard any leaves that have large tears in them because you don't want your dough leaking out! Rinse leaves under cool water briefly, pat dry with a clean cloth, and then stack them together. They can stay a little wet -- you can dry them off individually as you wrap them. I keep a towel with me for that purpose. Get your assembly line sation set up with the banana leaves, your bowl of masa, your olives, your meat, and your oil (dyed or not). If you can't find banana leaves, you can use parchment paper. Your Latin market likely sells it in packs with 25-50 sheets pre-measured to be around 18" by 12" for pasteles/hallacas/tamales and sold in the produce section near the unrefrigerated root vegetables. You can ask someone for "pasteles paper" and they will probably know what you are talking about. If not, use regular parchment paper cut to size. Assemble the pasteles (WATCH THE VIDEO, PLEASE!!! ): Begin by greasing the center of your banana leaf with about 1 Tbsp of oil. Add 1/2 cup masa on top of the oil and spread evenly into an oval shape with a spoon. Next, layer about 2-3 Tbsp of meat mixture off-center away from you in the masa. Place several olives in the meat mixture. Fold the pasteles by grabbing the banana leaf edge closest to you and folding up. Lay the leaf flat and press down from the top with your hands to create a straight edge in the dough, then fold the top down, trying to meet the top edge with the folded edge. Then, use your hands to shape the sides, being careful not to press to hard so as to force all the dough out the other side. Fold the sides up, then wrap in a second banana leaf. Use a third leaf if necessary. Then, tie with string. I can't explain in words, you just have to watch the video! It is impossible to do this correctly just by reading words alone. I watched my mother-in-law make these several times before attempting myself. If using parchment paper, lay it so that the long edge is running from your left to right (and not top to bottom). Use the same procedure for filling them, but when you fold it, line the edges of the paper together and then fold them down about 1/2-1 inch, then fold the top edge down to the crease. Fold up the sides and tie with string. You should only need 1 piece of parchment paper but may use 2 if it doesn't seem secure enough. PLEASE WATCH THE VIDEO AS THIS IS DIFFICULT TO EXPLAIN IN WORDS! My mother-in-law warned me to always make one pastele, boil it, and taste it before proceeding with assembling the whole batch. This is to make sure the dough has a good flavor and is salted enough. It's up to you! After you finish, pat yourself on the back and high five your friends or family who helped you. Good job! You can freeze your extra pasteles to enjoy later. I've kept them for up to a year and they've been fine. To cook them, add to a pot of boiling water and cook covered for about 30 minutes. They do float, so about halfway through it's usually a good idea to flip them over. If cooking from frozen, increase time to about 40-45 minutes. Carefully remove from the boiling water and place on a plate. Use kitchen shears to cut away the string. Very carefully open up the leaves or paper to expose the cooked goodness inside. Enjoy! These are a meal in themselves, but I like to serve them with some type of cooked green, like my Brazilian style collard greens. Want to Pin it? Use this link!